This is the very easy and quick earrings for beginner. Checkout the free tutorial below. Enjoy! You can substitute crystal 3mm with pearl 3mm as I did with white version. 15/0 is optional, you can use 11/0. I bought teardrop pearls from this shop, http://stores.ebay.com/beautyandthebeads/ (from China). Other materials should not be hard to find. Cut the thread around 20 inches. Pick up pearl 6mm, 11/0, pearl 4mm, 11/0, crystal 3mm, 11/0, pearl 4mm and 11/0. Pass through pearl 6mm (red arrow). Continue through the next 11/0, pearl 4mm and 11/0 (blue arrow). Pick up three 11/0s. Pass through 11/0 just exited (red arrow) and the first 11/0 just picked up (blue arrow). Pick up crystal 3mm, 11/0, crystal 3mm and 11/0. Pass through 11/0 (red arrow). Pick up two 11/0s. Pass through two 11/0s (red arrows). Pass through the next pearl 4mm, 11/0, pearl 6mm, 11/0, pearl 4mm, two 11/0s, crystal 3mm and 11/0 (red arrow). Pass back through teardrop pearl and 11/0 (red arrows). Pick up 11/0 and pass through 11/0 (blue arrow). Pass through your beads up to pearl 6mm (red arrow). Pick up two 11/0s, crystal 3mm, 11/0, earring hook, 11/0, crystal 3mm and two 11/0s. Pass through pearl 6mm (red arrow). Pass through all beads here twice to reinforce your thread path. Make another earring the same way. 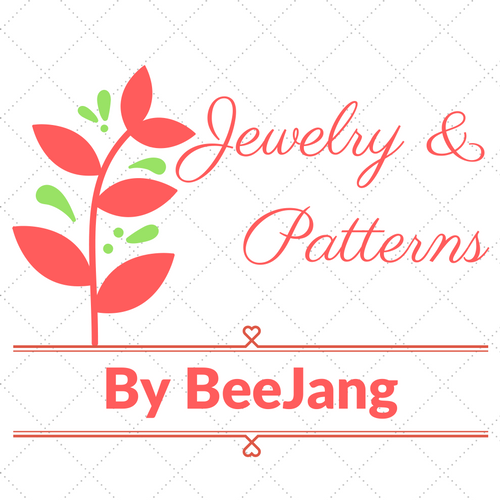 Hope you like this pattern, happy beading!